Century old mine tailings in the Cobalt and Silver Center areas are widely dispersed throughout the terrestrial and aquatic environments and contain high concentrations of arsenic. Arsenic concentrations were found to be as high as 972 μg/L in surface waters and 10,800 mg/kg in lake sediment. The mean values for arsenic in surface waters and sediment from 9 lakes directly influenced by mining activity were 431 μg/L and 1704 mg/kg, respectively, whereas in the 12 control lakes with no mining activity in their catchment had mean values of 2.2 μg/L and 11 mg/kg in their water and sediment, respectively. Lakes impacted by downstream tailing migration (n = 4) were also assessed and had intermediate concentrations of arsenic. Principal component analysis identified contaminated lakes as having different geochemical signatures than control lakes but lake sediment that was sampled below tailings in contaminated lakes, deposited pre-mining, can resemble the geochemistry of those found in control lakes. Arsenic concentrations in these samples ranged from 4.4 to 185 mg/kg, which can be considered reasonable background as these areas contained abundant mineral deposits that could naturally elevate background concentrations. Even though background concentrations are naturally elevated, the presence of arsenic-rich tailings in these lakes has prevented any natural recovery from occurring. Fe-Mn oxides at the water-sediment interface perpetually scavenge arsenic from buried tailings below and from contaminated surface waters that cause arsenic concentrations to remain enriched in the upper sediments even after tailings have been buried by lake sediment. This process has prevented recovery of the lake ecosystems even after nearly a century without mining. The online version of this article ( https://doi.org/10.1007/s11270-018-3741-1) contains supplementary material, which is available to authorized users. The authors would like to thank Dr. Fred Michel for helpful discussions on the history of mining and arsenic contamination in the Cobalt region. This research was funded by an NSERC Discovery Grant to JCV. Andrade, C. F., Jamieson, H. E., Kyser, T. K., Praharaj, T., & Fortin, D. (2010). Biogeochemical redox cycling of arsenic in mine-impacted lake sediments and co-existing pore waters near Giant Mine, Yellowknife Bay, Canada. Applied Geochemistry. https://doi.org/10.1016/japgeochem200911005. Blais, J. M., & Klaff, J. (1995). The influence of lake morphometry on sediment focusing. Limnology and Oceanography, 40. https://doi.org/10.4319/lo.1995.40.3.0582. Borvůka, L., Vacek, O., & Jehlička, J. (2005). Principal component analysis as a tool to indicate the origin of potentially toxic elements in soils. Geoderma. https://doi.org/10.1016/j.geoderma.2005.04.010. Couture, R. M., Gobeil, C., & Tessier, A. (2010). Arsenic, iron and sulfur co-diagenesis in lake sediments. Geochimica et Cosmochimica Acta. https://doi.org/10.1016/j.gca.2009.11.028. Galloway, J. M., Swindles, G. T., Jamieson, H. E., Palmer, M., Parsons, M. B., Sanei, H., Macumber, A. L., Patterson, R. T., & Falck, H. (2017). Organic matter control on the distribution of arsenic in lake sediments impacted by ~65 years of gold ore processing in subarctic Canada. Science of the Total Environment. In press. https://doi.org/10.1016/j.scitotenv.2017.10.048. Grunsky, E. C., Mueller, U. A., & Corrigana, D. (2014). A study of the lake sediment geochemistry of the Melville Peninsula using multivariate methods: applications for predictive geological mapping. Journal of Geochemical Exploration. https://doi.org/10.1016/j.gexplo.2013.07.013. Harris, J. R., & Grunsky, E. C. (2015). Predictive lithological mapping of Canada's North using random forest classification applied to geophysical and geochemical data. Computers and Geoscience. https://doi.org/10.1016/j.cageo.2015.03.013. Houben, A. J., D’Onofrio, R., Kokelj, S. V., & Blais, J. M. (2016). Factors affecting elevated arsenic and methyl mercury concentrations in small shield lakes surrounding gold mines near the Yellowknife, NT, (Canada) Region. PLoS One. https://doi.org/10.1371/journal.pone.0150960. Kihlman, S., & Kauppila, T. (2010). Tracking the aquatic impacts of a historical metal mine using lacustrine protists and diatom algae. Mine, Water, and the Environment. https://doi.org/10.1007/s10230-009-0096-2. Matchullat, J., Ottenstein, R., & Reimann, C. (2009). Geochemical background—can we calculate it? Environmental Geology. https://doi.org/10.1007/s002549900084. Nikolaidisa, N. P., Dobbsb, G. M., Chenc, J., & Lackovicc, J. A. (2004). Arsenic mobility in contaminated lake sediments. 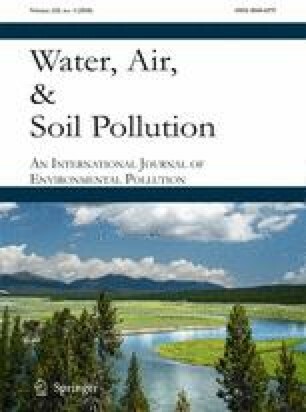 Journal of Environmental Pollution. https://doi.org/10.1016/j.envpol.2003.11.005. Panahi, A., Cheng, Q., & Bonham-Carter, G. F. (2004). Modelling lake sediment geochemical distribution using principal component, indicator kriging and multifractal power spectrum analysis, a case study from Gowganda, Ontario. Geochemistry: Exploration, Environment, Analysis. https://doi.org/10.1144/1467-7873/03-02. R Core Team. (2016). R: a language and environment for statistical computing. R Foundation for Statistical Computing, Vienna. http://www.R-project.org/. Accessed Feb 19 2018. Reimann, C., Filzmoser, P., & Garrett, R. G. (2005). Background and threshold: critical comparison of methods of determination. Science of the Total Environment. https://doi.org/10.1016/j.scitotenv.2004.11.023. Sprague, D. D., Michel, F. A., & Vermaire, J. C. (2016). The effects of migration on ca. 100-year-old arsenic-rich mine tailings in Cobalt, Ontario, Canada. Environmental Earth Sciences. https://doi.org/10.1007/s12665-015-4898-1. Thienpont, J. R., Korosi, J. B., Hargan, K. E., Williams, T., Eickmeyer, D. C., Kimpe, L. E., Palmer, M. J., Smol, J. P., & Blais, J. M. (2016). Multi-trophic level response to extreme metal contamination from gold mining a subarctic lake. Proceedings of the Royal Society: Biological Sciences. https://doi.org/10.1098/rspb.2016.1125. Wei, C., & Wen, H. (2012). Geochemical baselines of heavy metals in the sediments of two large freshwater lakes in China: implications for contamination character and history. Environmental Geochemistry and Health. https://doi.org/10.1007/s10653-012-9492-9. Zaharescu, D. G., Hooda, P. S., Soler, A. P., Fernandez, J., & Burgelea, C. I. (2009). Trace metals and their source in the catchment of the high altitude Lake Respomuso. Central Pyrenees. Science of the Total Environment. https://doi.org/10.1016/j.scitotenv.2009.02.026.